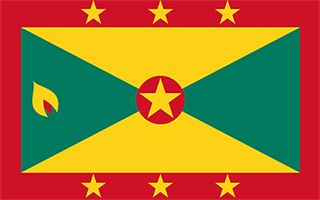 Grenada with its capital `Alavi Kola is located in North America (Caribbean, island between the Caribbean Sea and Atlantic Ocean). It covers some 345 square kilometers (twice the size of Washington, DC) with a population of 111,724. English is the language spoken by people in Grenada. There are no land based border this country shares with any other country. Grenada is a group of three larger islands (Grenada, Carriacou, and Petite Martinique) and several tiny islands in the Caribbean, or West Indies. It lies just northeast of Trinidad and Tobago, and southwest of Saint Vincent and the Grenadines. It is famous for spices and is known as the Spice Isle, being a major source of nutmeg, cloves, ginger, cinnamon, and cocoa. The terrain is volcanic in origin with central mountains. The average density of population is about 325 per km². The climate in Grenada can be described as tropical with tempered by northeast trade winds. Possible natural disasters include hurricane season lasts from June to November, lies on edge of hurricane belt and Mount Saint Catherine (840 m) lies on the island of Grenada; Kick 'em Jenny, an active submarine volcano (seamount) on the Caribbean Sea floor, lies about 8 km north of the island of Grenada; these two volcanoes are at the southern end of the volcanic isl. To reach someone Grenada dial +1-473 prior to a number. The local cellular networks are operated on 850 MHz, 900 MHz, 1800 MHz. Websites typically end with the top level domain ".gd". If you want to bring electric appliances (e.g. battery chaarger), keep in min the local 230 V - 50 Hz (plugs: G). The sign for the locally used currency Dollar is XCD. A rectangle divided diagonally into yellow triangles (top and bottom) and green triangles (hoist side and outer side), with a red border around the flag; there are seven yellow, five-pointed stars with three centered in the top red border, three centered in the bottom red border, and one on a red disk superimposed at the center of the flag; there is also a symbolic nutmeg pod on the hoist-side triangle (Grenada is the world's second-largest producer of nutmeg, after Indonesia); the seven stars stand for the seven administrative divisions, with the central star denoting the capital, St. George; yellow represents the sun and the warmth of the people, green stands for vegetation and agriculture, and red symbolizes harmony, unity, and courage.